Each one of us has wasted at least a few minutes of our lives watching animal videos, which means odds are high that you’ve seen a fluffy cat throw himself into a too-small cardboard box — and succeed! I see this in my own home as well. When I unpack groceries from a brown paper bag, I “accidentally” leave it on the floor so my oversized house cat can be easily entertained for awhile. I act as if I don’t see or hear her 15-pound body filling up the bag and let her swat at my ankles as I innocently walk past. She thinks she’s a ninja, and I’m just thrilled she’s exerting any amount of physical energy. The same goes for shipping boxes, suitcases and other containers. If she can get in, on or under it, she’ll do it. Virtually all cat owners know of their pets’ affinity for boxes and bags, but the reasons behind this fascination generally remain a mystery to the common man. 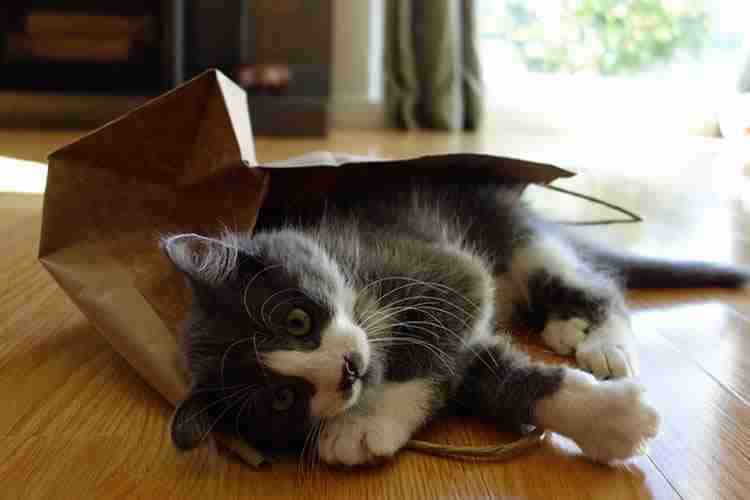 Animal behaviorists and veterinarians, however, have much more insight into the appeal of both bags and boxes for domestic felines. A domestic cat’s lineage leads back to wild felines whose lives were endangered on a regular basis — much more so than your (or my) lazy house cat. To survive, they often sought out confined spaces that allowed them to not only hide, but reduce their vulnerability by narrowing their field of vision. In the wild, this could mean a cave, den or even a treetop, but in today’s world, it may be a new shoebox left on the closet floor. Once in their secret perch, cats tap into their genetic predisposition as ambush predators, attacking threats like other animals and passing ankles. Hiding in boxes and bags also serves as a coping mechanism for domestic cats. From environmental changes like loud noises and unfamiliar visitors to other stressors such as physical pain, boredom or sadness, indoor cats often take comfort in a cozy, quiet spot. A confined space feels safe and allows your furry friend to rest and relax. Some cat owners notice that their pets are drawn to plastic shopping bags in particular, and the reasons for this attraction are vague. Some believe that cats’ strong sense of smell can pick up on the previous contents, since plastic is porous and retains odors easily. Others think the interest stems from the crinkling sounds the plastic can create, which may mimic the scurry of rodents and other small critters that appeal to felines. Whatever the explanation, plastic bags do serve as serious choking hazards for any living being, so be cautious if you let your pet play with them. The appeal of boxes and bags is an innate one for cats, so encourage that natural connection to their old-school heritage by leaving that Amazon box on the floor a little longer than normal. Your furball will thank you!